Police launched tear gas and water cannons at 400 people protesting the construction of the Dakota Access Pipeline this weekend. 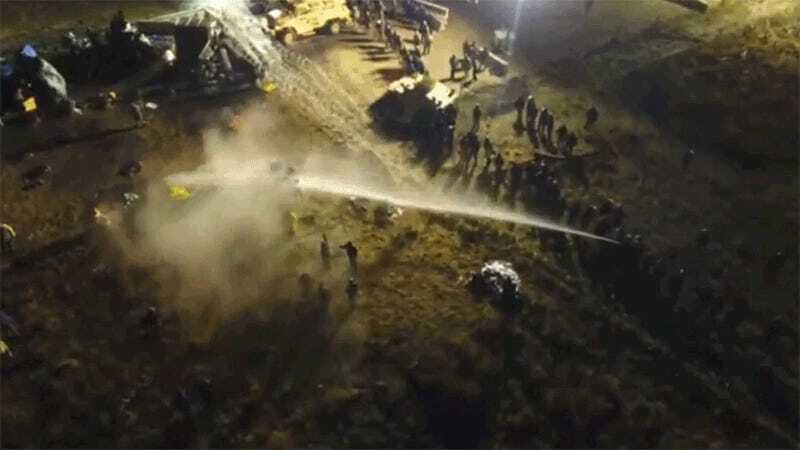 Drone footage shows the water cannons being sprayed at protesters in freezing cold temperatures. Eventually, police tried to shoot down the drone with said water cannons. The pipeline will stretch 1,200 miles and carry crude oil from North Dakota to Illinois. The $4 billion pipeline is built by Texas-based Energy Transfer Partners. If completed, the pipeline would carry 570,00 barrels of crude oil daily and would be built to pass under the Missouri River. However, some say that the pipeline poses a tremendous environmental risk. The protests have been led by the Standing Rock Sioux tribe, who say the pipeline will travel under a primary source of drinking water. The tribe also says the pipeline would go through a sacred burial ground. Politico reported earlier this month that the Obama administration would approve the pipeline, but the administration later pushed back, saying it hadn’t made a decision yet. Over the weekend, the weeks-long protests took another violent turn. Police dressed in riot gear were also using rubber bullets, tear gas, and concussion grenades, according to The Washington Post. The water cannons were brought out in 20-degree weather, injuring several, after protesters attempted to cross a bridge that leads to a construction site for the pipeline. The bridge has been closed since October 27, when protesters burned vehicles as police pushed them away from the construction site. “There are multiple fires being set by protesters on the bridge and in the area of the bridge,” Morton County Sheriff’s Department spokeswoman Donnell Hushka told CNN. “We have firetrucks on the scene they are using their fire hoses to put out the fires, wet the land around so fires don’t spread and they are also using water as crowd control.” It’s unclear why exactly fires were being set, but quite ironically, some protesters said they were to warm protesters who had been hit by water cannons in freezing weather. And with last weekend’s water cannon standoff, there appears to be no end in sight for these protesters.